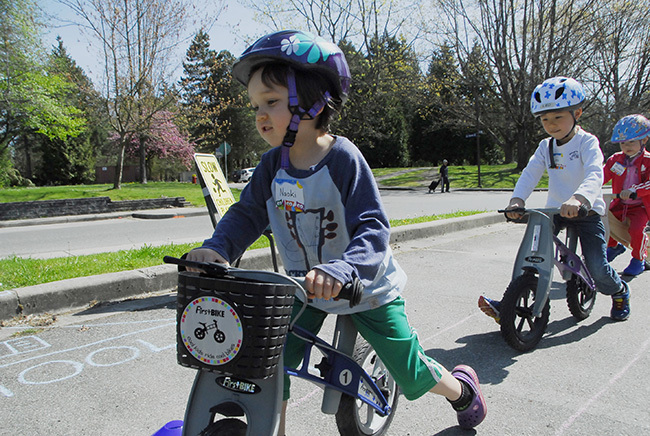 We love sharing stories about people who are passing on their enthusiasm for active transportation to others in their community – especially when those individuals are children. So when we heard about organizer Maya Goldstein’s Kids on Wheels, we jumped at the opportunity to write about this exciting and inspiring program. Goldstein has always had a passion for cycling, making it a regular part of her daily commute for a number of years. That enthusiasm brought her to HUB Cycling, where she has spent some time as a volunteer. It was during this time, learning about the bike education programs HUB offers, that Goldstein began to imagine the program. 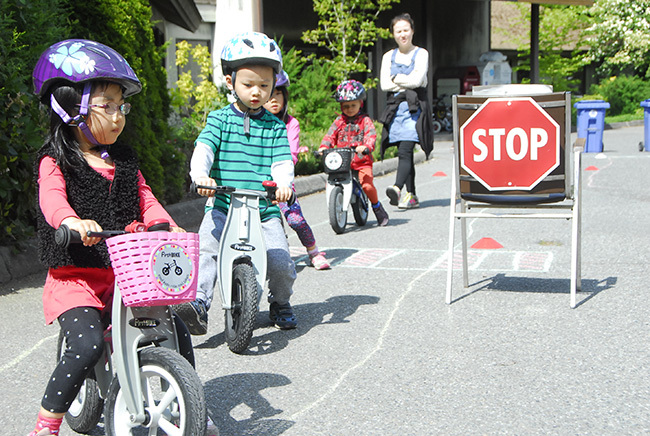 Existing cycling education programs are only offered to children in grade four and upwards, Goldstein thought an important age group was being overlooked – specifically preschool children. 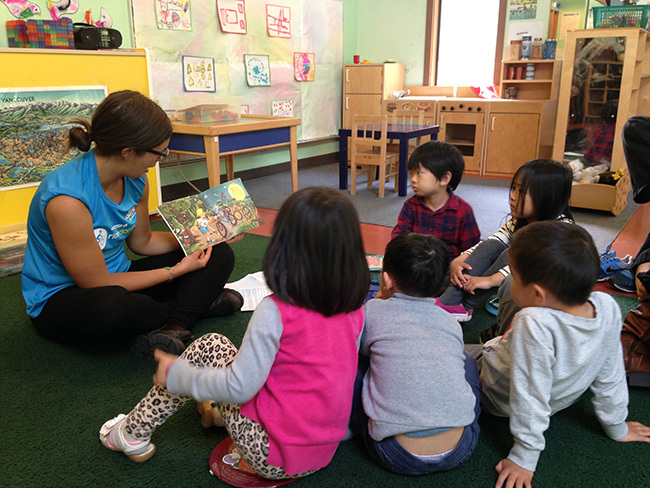 With a background in early childhood education, she felt her knowledge about cycling, merged with her skills as an educator, could create something to fill the void. And so Kids on Wheels was born. “There is still a lot of car culture embedded in the way young children play,” states Goldstein, referring to the car mats, trucks, and toy cars prevalent in daycares. 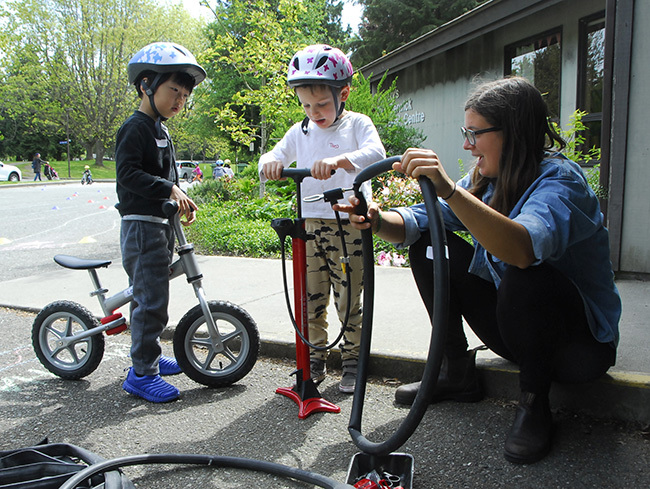 “I wanted to help bring bike culture into that environment.” Goldstein set to work developing a five day, age appropriate program, combining 45-minutes of in-class learning with equal time experience learning on balance (pedal-less) bikes. 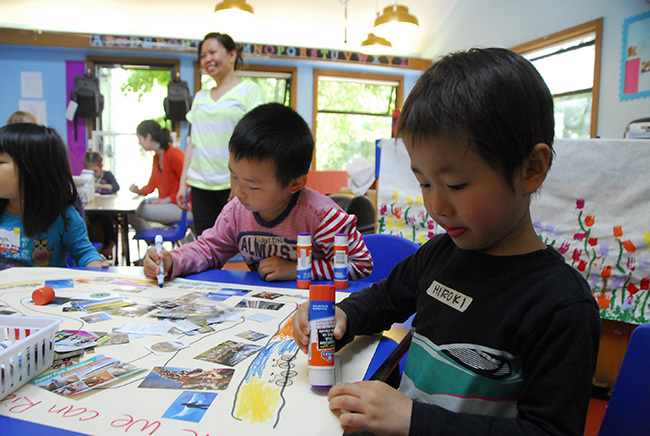 With the help of staff hired from local community bike shops Kickstand in East Vancouver and UBC’s Bike Kitchen, the in-class portion the program involves activity based learning, including story time. Of the kids’ top books are Sally Jean, the Bicycle Queen – a long time favourite in our own home – and Best Bike Ride Ever, which follows a young boy as he rides to iconic places around the world. 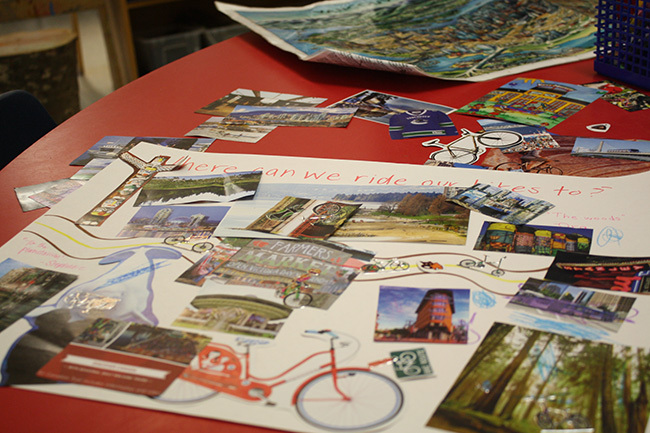 This particular story offers a great segue to an activity where the children create a map of all the places in Vancouver to which they would like to cycle. “We provide them with cut-outs of city landmarks that they paste on their map, and have an existing map set out, highlighting these locations,” Goldstein explained. She mused that often – after hearing the story – the kids run to the map and start excitedly rhyming off all places the kids want to go by bike. During the cycling skills portion of the day, the children get to ride balance bikes around a set course; bikes graciously donated by MEC, Runners, FirstBIKE, and Norco John Henry. 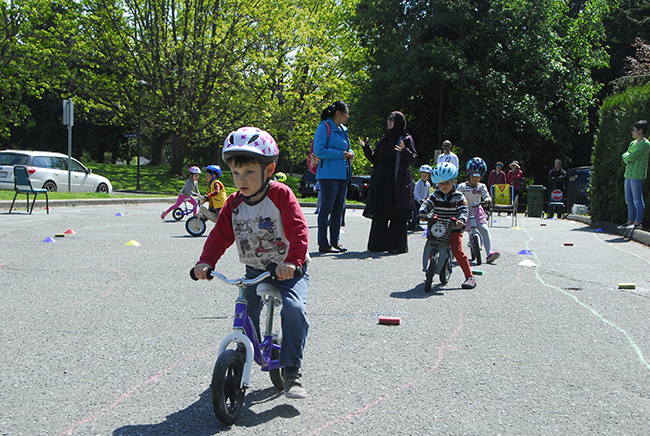 They were also donated helmets by Obsession: Bikes in North Vancouver, and other accessories by MEC. 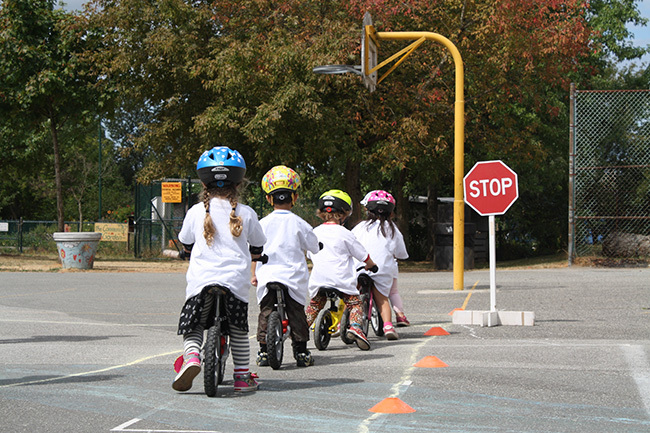 While on the bikes, Goldstein and the other staff members start by teaching the children how to stop, eventually increasing the challenge by changing up the course each day, mixing in different intersection types they will encounter riding on the road. 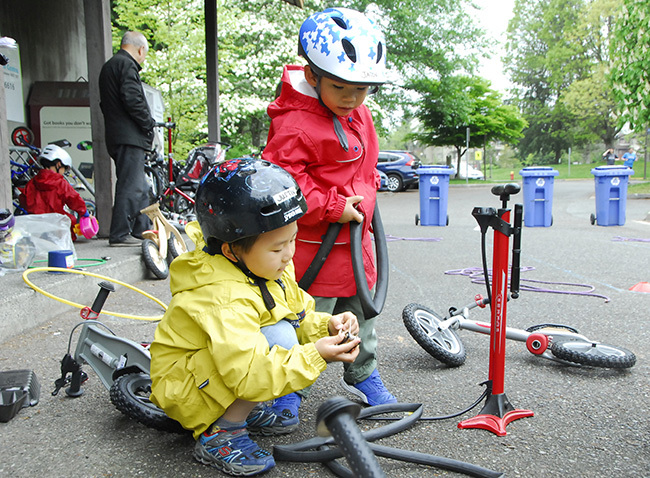 There is also a “Mechanic’s Corner”, where the children get to learn about the various parts of the bike, and how to pump tires. Most importantly, though, it’s about having fun on bikes! “It’s amazing to watch them grow in ability and confidence over the course of the five days.” Goldstein recalls. 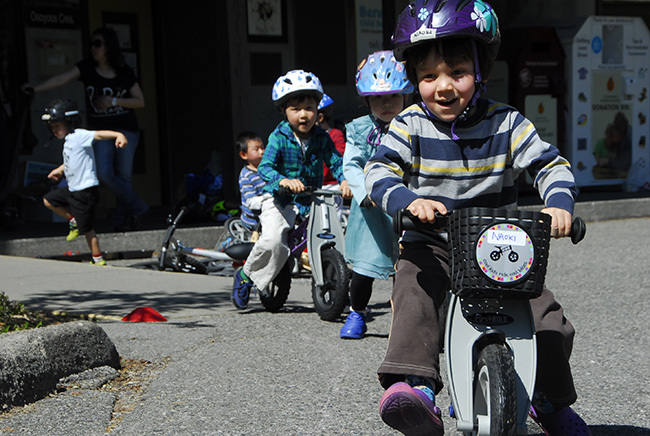 Through a grant from MEC, as well as support from the BC Cycling Coalition, she has been able to offer the program at two daycares in East Vancouver, as well as two separate sessions at Berwick Daycare in UBC. During the most recent session at Berwick, the class included children with varying special needs, which posed a different – but surmountable – challenge. On the first day, when the rest of the children ran outside to start riding, a young boy with Autism insisted on staying and watching. But after ten minutes of seeing his peers laugh and enjoy the bikes, we came out to join them. It is transformational stories like these that are encouraging for Goldstein, knowing she is making a difference in these children’s lives. 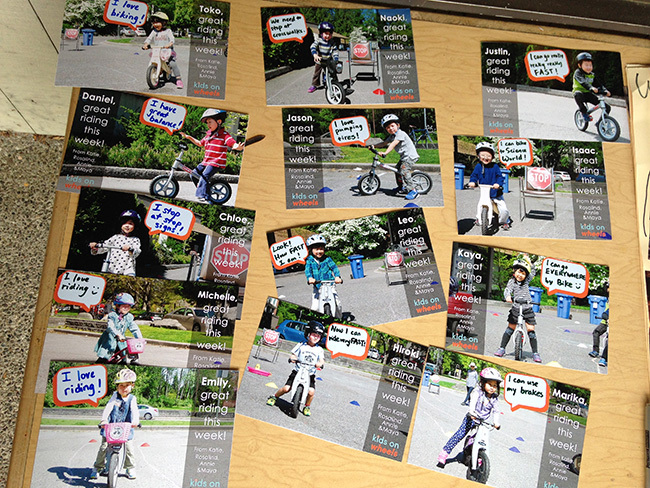 The Kids on Wheels Program is now on hiatus until Goldstein can secure ongoing funding. If you or your organization would like to support the program for future daycares, please contact Maya Goldstein at [email protected]. You can also donate to the program by clicking here.